French With Shelley | Sacré Charlemagne ! Home » Vidéos du jour » Sacré Charlemagne ! In France, it is often said that the Emperor Charlemagne invented the school system, and there is a song frequently sung by students at the time of the "rentrée" which blames Charlemagne for the drudgery of school. Have a listen . The song is sung by France Gall. In fact "schools" existed well before Charlemagne in the monastries, for example. However, he wanted to develop the reading, writing and arithmetic skills of his subjects and this initiative is considered the birth of the free and secular schools of the future. "Avoir une autre langue, c’est posséder une deuxième âme." 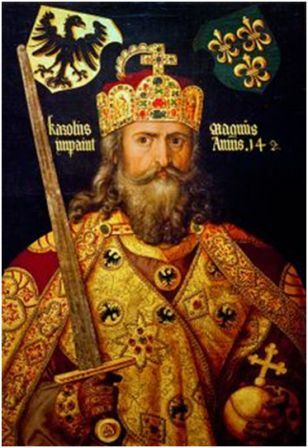 Charlemagne, also known as Charles the Great was King of the Franks. Charlemagne has been called the "Father of Europe" (Pater Europae), as he united most of Western Europe for the first time since the Roman Empire and laid the foundations for modern France, Germany and the Low Countries. He took the Frankish throne in 768 and became King of Italy in 774. From 800, he became the first Holy Roman Emperor—the first recognised emperor in Western Europe since the fall of the Western Roman Empire three centuries earlier. His rule spurred the Carolingian Renaissance, a period of energetic cultural and intellectual activity within the Western Church. All Holy Roman Emperors up to the last Emperor Francis II, as well as both the French and German monarchies, considered their kingdoms to be descendants of Charlemagne's empire. Charlemagne died in 814, having ruled as emperor for just over thirteen years. He was laid to rest in his imperial capital of Aachen in what is today Germany. The clip is in French and subtitled in French. Un jour d’inventer l’école ? Que les dimanches, les jeudis ? Sacré, sacré, sacré, sacré, sacré Charlemagne ! De batailles et de chasse. D’aller chaque jour en classe. Et faire des tas de dictées. Il n’y aurait que des jeudis.